Bagot 1815-20 Ringgold House, corner of L and 25 St.
Canning 1820-25 N side of Pa. Ave between 20 and 21 St.
Fox 1836-44 S side of K St between New Hampshire Ave and 24 St.
Lytton Bulwer 1849-52 corner of I and 18 St.
Napier 1857-58 1710 H St between Vermont Ave and 16 St.
Lyons 1858-65 1710 H St between Vermont Ave and 16 St.
Bruce 1865 Pa. Ave at corner 25 St; 1865-67 Ringgold House, cnr of L and 25 St.
Thornton 1867-75 Myer House, 1627 I St on corner with 17 St.
Only the Ringgold house served twice for the legation, and only the Decatur House still stands today: all of the houses lay in the area bounded by H and L Streets and by 16th and 25th Streets. Sir Edward Thornton, who leased the Myer house soon after his arrival in 1867, resolved to establish a permanent home for the legation by the time that his lease expired in 1872 (he could not know that he would remain in Washington for over thirteen years). He encouraged London to buy a suitable house, but the high cost of those he proposed held no appeal for London. After several fruitless years, Thornton tried the different tack of proposing that London should buy a site and build upon it, all within an agreed cost limit. The Treasury agreed in 1872 and Thornton bought a site (which he then conveyed to the Commissioners of Works) of about 30,000 square feet, on the NW corner of the junction between Connecticut Avenue and N Street, from James M. Latta (a trustee) in 1873, for just under $15,000. This site, the first foreign-owned legation property in Washington, was adventurously far north for the time. 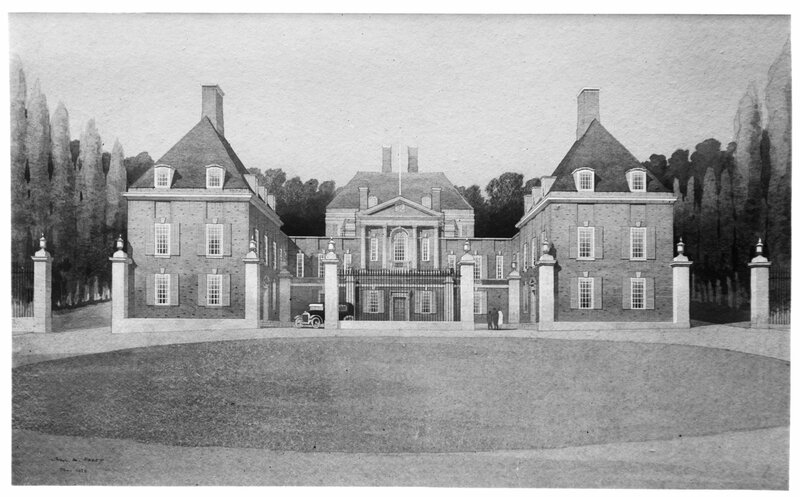 Thornton commissioned plans from the architect John Fraser, of Washington DC and Philadelphia, for a fine house in a Second Empire style, with a small wing for chancery offices. Against the Office of Works’ expectations, construction of the house went well in the hands of Robert I. Fleming as builders and the project overspent by only a little. Thornton moved in during 1875. A local paper was suitably impressed: it thought the new building ‘may yet be compared to the rugged headland of some storm-swept cape’. 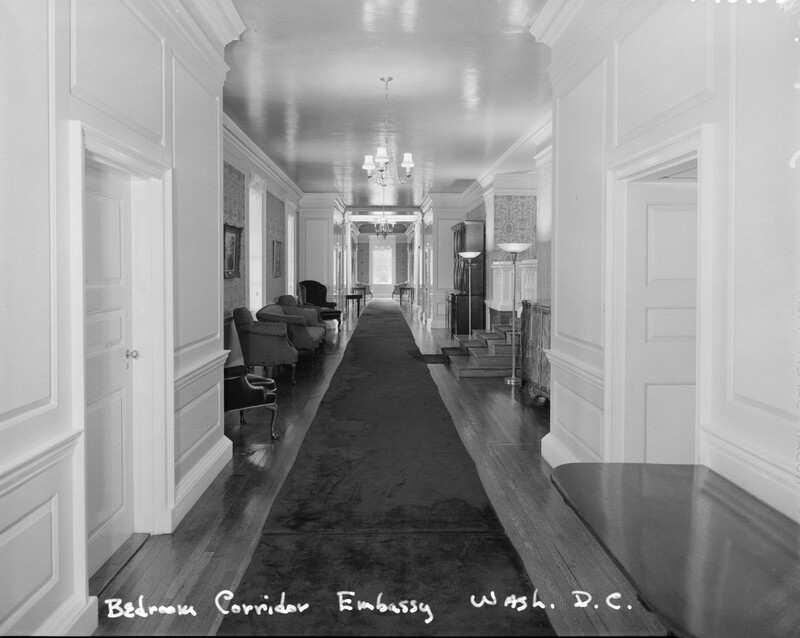 The house was the best building in the vicinity of Dupont Circle, where many other embassies joined it over the years, and became a much-loved part of Washington’s political and social life. 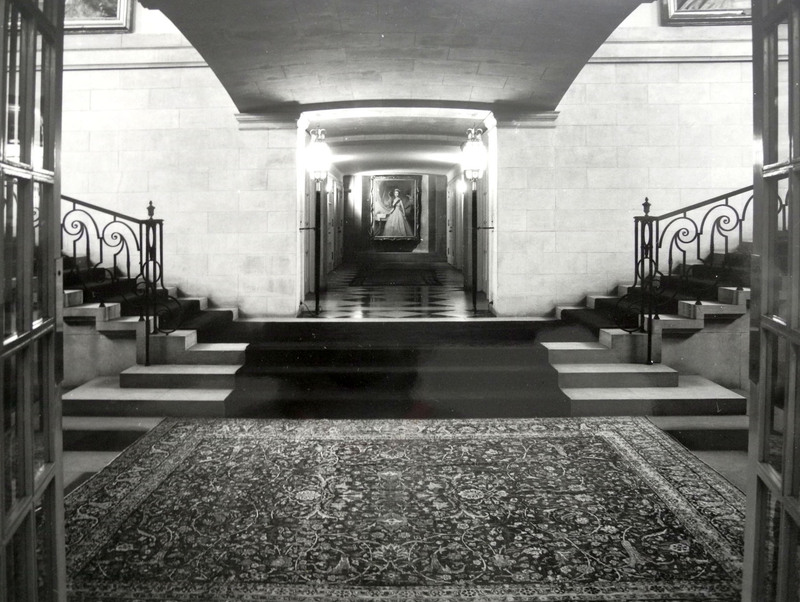 A 1925 painting of the building by Arthur F. Musgrave hangs in the present residence. The legation was upgraded to an embassy in 1893. The house served brilliantly until the 1920s. By then, the case for moving out had grown strong: the area was extremely congested, the noise from the double tramway required the windows to be closed, offices in huts overran the garden, and the widening of Connecticut Avenue would soon raze the porch. An agreement was signed in May 1925 between the Office of Works and Harry Wardman, Washington’s most successful property developer, by which Wardman would exchange for the Connecticut Avenue property a new site for the embassy on Massachusetts Avenue and $300,000 payable upon the embassy vacating Connecticut Avenue. This event was achieved in March 1931, when Wardman leased the building as offices to the International Association of Machinists for a year or two and then demolished it. Harold Nicolson, who had worked in the building, recorded sadly in his diary for 16 February 1933 ‘I then walked down to the site of the old Embassy. It has been completely cleared of buildings and the large triangular site is now occupied by second hand cars standing cheek by jowl in the mud’. 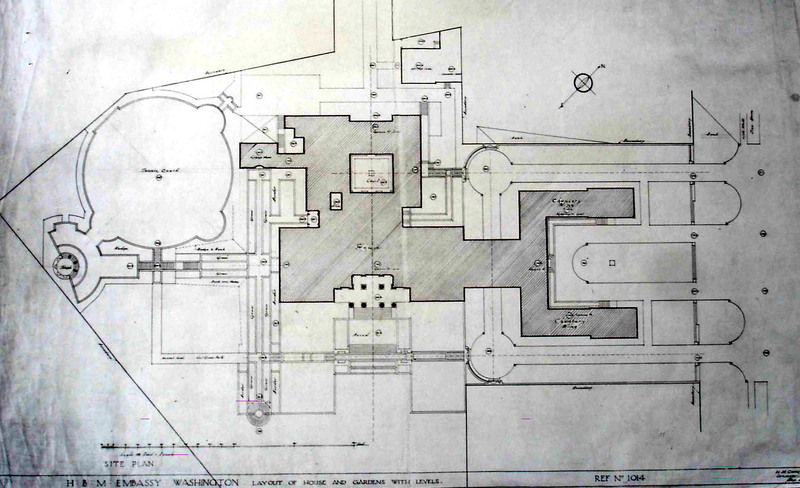 The design and construction of the new embassy and garden is described in some detail in Chapter 9 of Room for Diplomacy, pp. 197-207. Sir Edwin Lutyens rapidly arrived at a marvellously apt concept for the awkwardly shaped site; his office produced an exemplary set of drawings; Wardman won the tender, and struggled to complete the building during the Depression; Lutyens’ associated architect in Washington, Frederick H. Brooke, supervised the works with great skill; and Earle and Allison in the Office of Works kept in close touch with the proceedings. 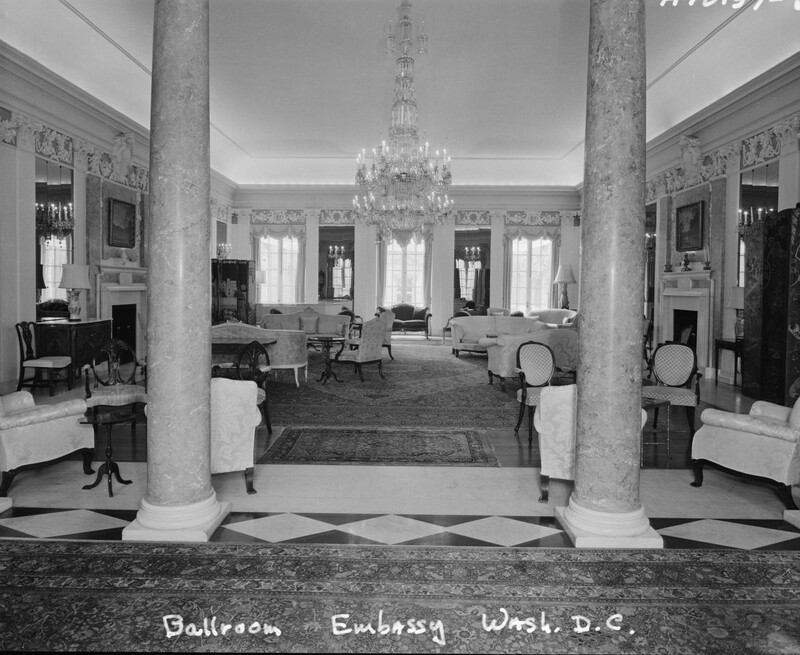 Various of the fittings and furnishings from Connecticut Avenue were transferred to the new residence, notably the three ballroom chandeliers. 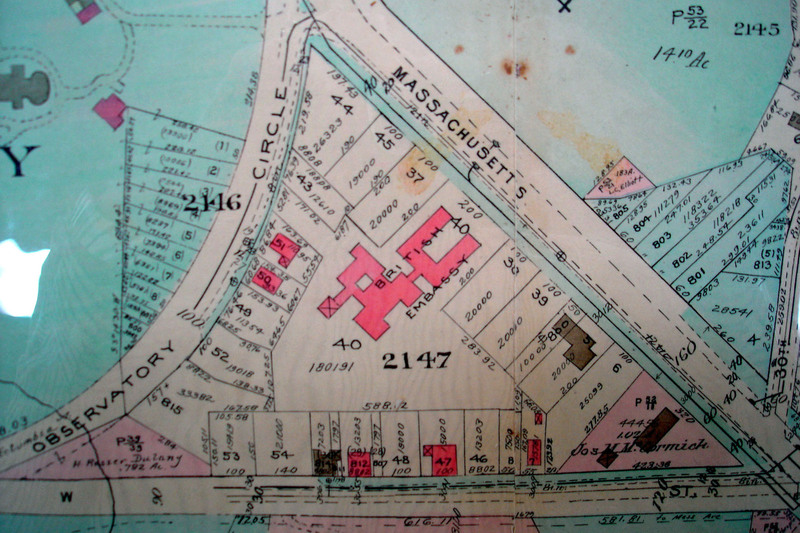 The site acquired from Wardman in 1925 was the void in the middle of a triangle of roads, behind the gardens of the houses that fronted Massachusetts Avenue running NW-SE, Observatory Circle running NE-SW, and Whitehaven Street, running E-W. This four-and-a quarter acre site, designated Plot 40 in 1931, had an opening 200 feet wide on to Massachusetts Avenue in which Lutyens sited the chancery; and an access strip to Observatory Circle, which served as a drive to the back of the residence. In course of time, seven of the adjacent plots north and east of Plot 40 would be acquired and absorbed. They came in five tranches, in the following sequence, with varying degrees of difficulty. Sir Ronald Lindsay learned, soon after his arrival as ambassador in 1930, that Plots 38 and 39, on Massacchusetts Avenue just south of the chancery and together comprising about one acre, might be for sale at about £30,000 by their owner, Mrs Rinehart. In favour of purchase was the protection of the embassy from potentially unsuitable neighbours and the opportunity to improve the shape and size of the residence garden. Against purchase, besides the price, was the embarrassment of acquiring now what could have been had for much less ten years previously and which, if it had been bought then, would have caused Lutyens to plan the Embassy quite differently. The Treasury agreed to buying, ‘somewhat surprisingly’ thought Sir Lionel Earle, Secretary of the Office of Works, and authorised the expenditure in advance of Parliamentary approval of the Estimate. Earle annotated ‘I fear the House may raise a storm on this’ but it didn’t, and the sale went through in November 1930, the papers blandly recording that ‘This additional land was purchased in order to preserve the amenities of the Embassy site.’ The Office of Works, in conformity with its policy on gardens at the time, refused to pay for landscaping the new land into the garden and it therefore remained as rough ground until Lord Lothian arrived as ambassador in 1939 and paid for the integration works himself (as rather ambiguously recorded on a small plaque on the site). 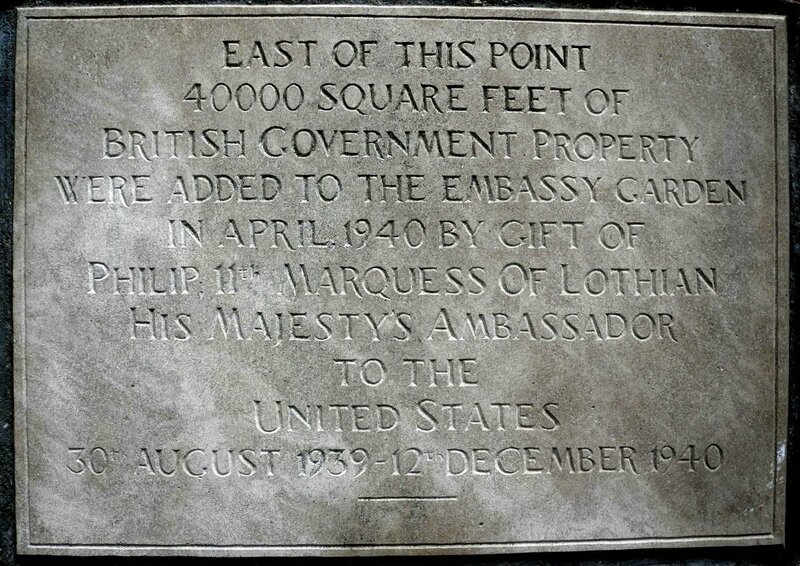 Plaque recording Lord Lothian’s gift of integrating Plots 38 and 39 into the embassy garden. In June 1941, Plot 43, which lay alongside the rear access to the residence, was acquired for $25,000 from Malcolm S McConihe and F Moran McConihe, again to safeguard the amenity of the embassy. In practice, the site was used within months for the erection of a three-storey block of temporary office accommodation. The possibility of acquiring Plots 37 and 45, on Massachusetts Avenue just north of the chancery, was considered in 1941, when they were on offer at $35,000, but initially turned down because of a scarcity of dollars. The Chancellor subsequently intervened and agreed to the purchase so as to protect, once again, the amenity of the embassy. Progress, though, was hindered by the discovery that the Panamanian Government had an option on the two plots until 1951, as they intended to build a new embassy on them. They rebuffed the ambassador’s advances, took up their options and, the following year, offered to sell the two plots to the British government for $75,000. Even though the price then came down, the Ministry of Works declined, believing that the amenities of the embassy were by now sufficiently protected. J.H. Markham, a superintending architect in the Ministry of Works, was the first to elaborate, in June 1942, the case for acquiring plots in Washington for the more positive reason of being able to build larger offices on them in the future. Markham also pointed out that it would be worth trying to acquire Plot 44, at the corner of Massachusetts Avenue and Observatory Circle, so as to consolidate a large and sensible site for the long term. But too much else was happening for this to be given any further thought at the time. Meanwhile, staff numbers at the embassy inexorably increased as the Second World War progressed and liaison with the Americans stepped up in every field. Lutyens’ chancery building was quickly overloaded, even though two temporary hutments of 10 and 6 rooms had been built in March and July 1940, and another storey put on one of them. A one-storey brick building of 19 rooms was built between the two wings of the open chancery courtyard in November 1940. The three-storey office block of 97 rooms was put up on Plot 43 in 1941. Another floor was added in 1942 to the chancery building itself on either side of the central portico; and in 1944 another floor was added to the annex building on Plot 43. An idea raised in 1943 to erect a small building in the residence garden was not pursued. In parallel with these accretions on the embassy site, various office premises were leased in the city: in 1940, staff specialising in aviation moved to the corner of Massachusetts Avenue and 18th Street, the former residence of Andrew Mellon; in the same year, the press people moved into a house leased from Wardman’s widow, a few blocks below the Embassy. After the war, thoughts turned to rationalising what had become a chaotic and over-crowded office site, and an expensive leasing commitment. The Foreign Office asked the embassy in May 1946 whether ‘it would be preferable that office buildings should be nearer the State Department and administrative centre. Can you assure us that if we put up new buildings on the Embassy site to house all our offices we should not be likely to regret it in the future?’. The embassy gave the necessary reassurances, the issue went to Cabinet that summer, and the idea of concentrating all the staff on the Massachusetts Avenue site was approved. The plan, however, depended on the successful acquisition of Plots 37 and 45 from the Panama Government. The omens were not looking good. The Panama ambassador in Washington had told the ambassador that the President of Panama was vigorously opposed to the sale of the two plots. Nevertheless, a firm offer of $100,000 was made for them in 1947. The Panamanians took two years to reply that the plots had been withdrawn from sale, and then until 1951 to conclude that they could not afford a new Embassy after all and were willing in principle to sell. It transpired, however, that disposal of an asset of this size required the consent of the Panamanian Parliament, and that took time – not least because three readings of mthe required legislation were required and the government changed between the first and second readings. There was then a requirement to seek competitive offers, and so on. The minutiae of this tiresome and lengthy negotiation were dealt with by the British minister in Panama (a patient man called Eric Cleugh) who was eventually, in December 1952, able to submit an offer in the name of the British government for $125,000. This offer was accepted at $130,000 and the plots were eventually conveyed to the Ministry of Works in January 1953. Meanwhile, acquisition of Plot 44, as recommended by Markham in 1942, from a Mr Thomas Ruffin was straightforward and completed in mid-1951, though payments were made over four years, with interest, to assist his tax planning. There was some talk at that time of also acquiring Plot 51, on the opposite side from Plot 43 of the rear access drive, the only other plot that could with advantage further improve the development site for a large new offices building. But that idea was not further pursued at that time. In the vicinity of Plots 43, 44 and 45 had formerly stood the renowned house and garden called Normanstone, built about 1830 for a Robert Barnard and occupied at the end of the century by Herman Hollerith, the founder of IBM. The exact location of Normanstone, however, has not been established. Fraser’s 1873 layout drawing for new legation buildings on Connecticut Avenue. 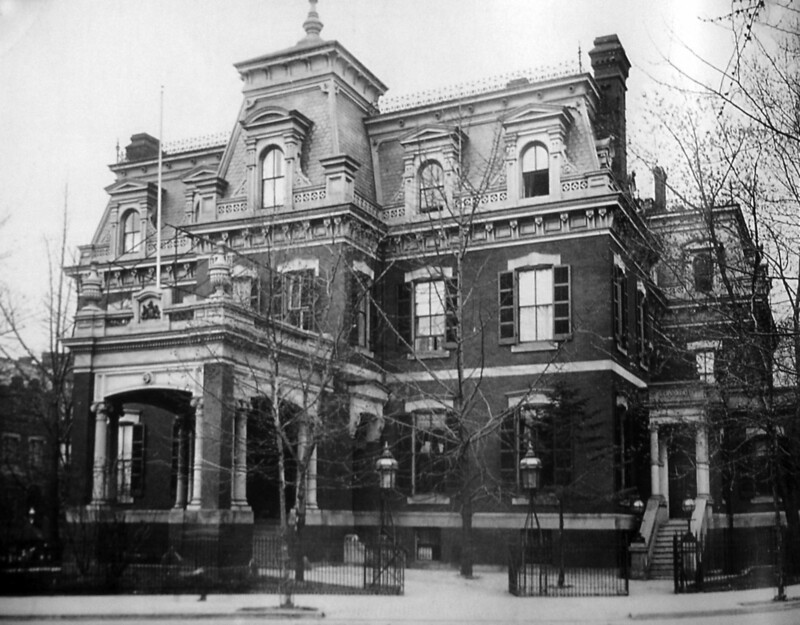 The Connecticut Avenue legation, completed 1875, vacated 1930 and demolished 1932. Part of Baist’s 1931 real estate map of Washington showing Lot 40 acquired for the new embassy buildings, with Lutyens’ subsequent buildings overlaid in pink. 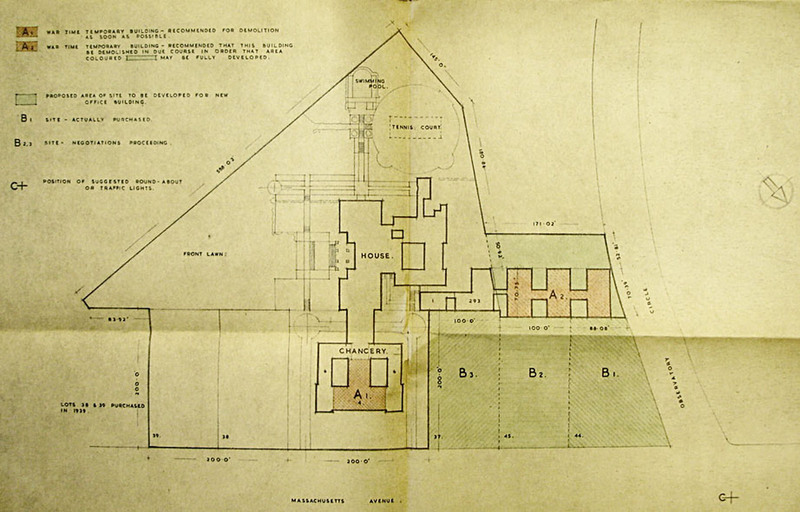 Lutyens’ layout of buildings, with residence on the left, facing south-east, and chancery on the right, facing north- east to Massachusetts Avenue. Drawing by Cyril Farey, 1926, of chancery building from Massachusetts Avenue, with residence behind. 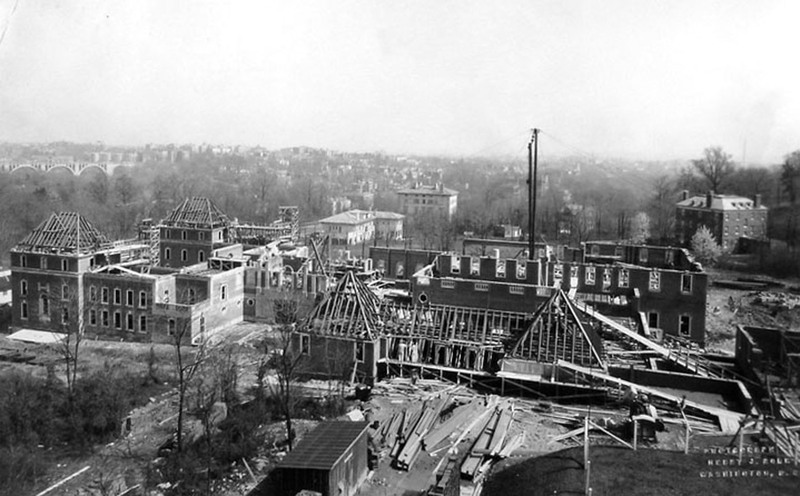 View of construction site in April 1929, from the north, with residence first floor built to windowhead level. 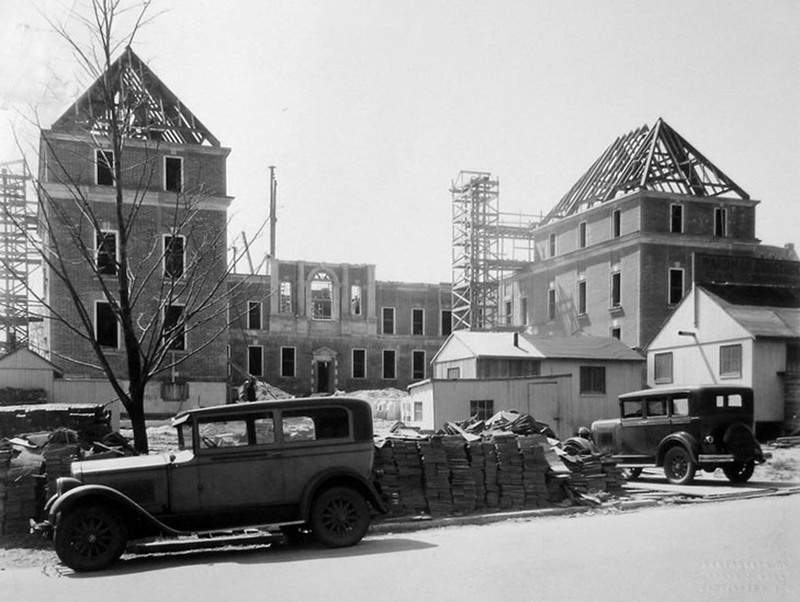 Chancery under construction, April 1929, viewed from Massachusetts Avenue. 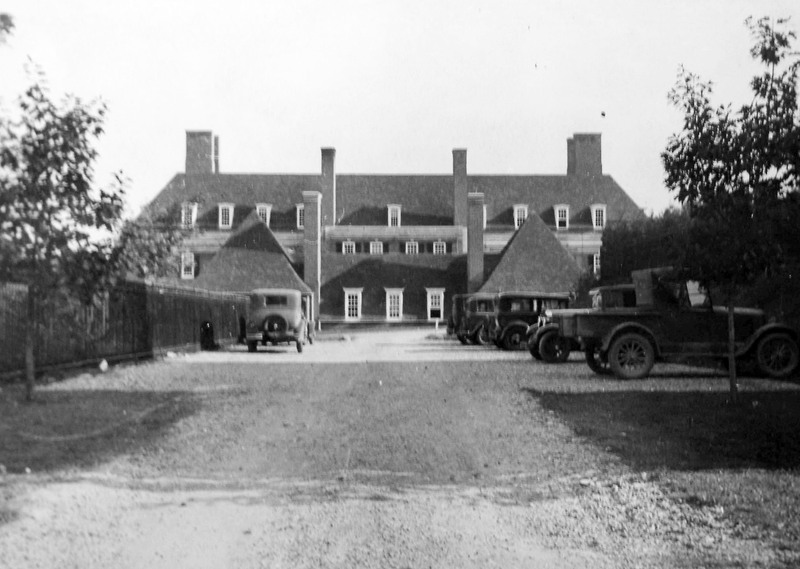 Rear of residence viewed from service entrance off Observatory Circle in 1930, indicating the slope of the site. 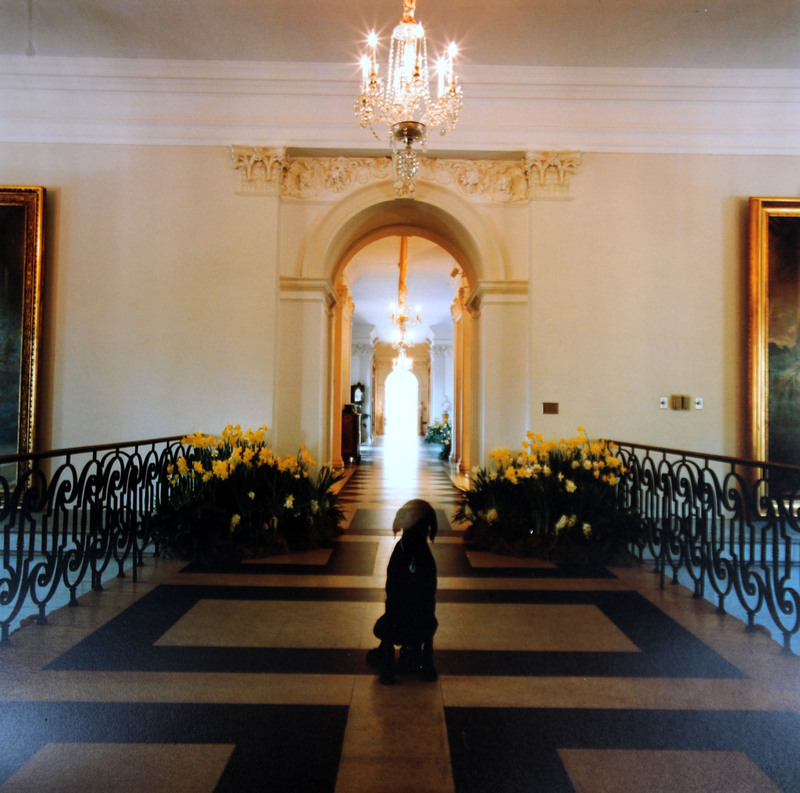 Residence entrance, with stairs either side to the bridge overhead that connects the residence to the ambassador’s study and the chancery. Standing on the bridge, looking down the principal residence corridor. 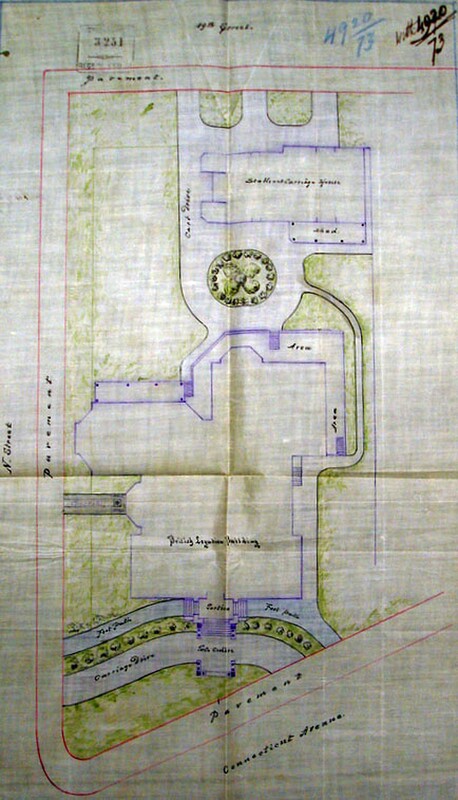 Siteplan 1943 showing office extension buildings behind residence and within chancery courtyard. Four-storey wartime offices extension block, demolished in 1958.